Earlier this summer, we got to hang out with the lovely Jennifer Bosworth, author of Struck, at Vroman's Books in Pasadena. We had a blast talking to Jennifer about the role of cults in her debut novel, what she was like as a teen, and her relationship with the city of Los Angeles as a transplant from Utah. Keep up with Jennifer at her website and be sure to visit her publisher, Macmillan. We happen to think Jennifer's book is the perfect kind of book to pick up when you're in a reading slump-- it's high-concept, action-packed, and a fun read. What do you do when you're in a reading slump? Comment on this post and tell us your favorite recommendations for books to get you out of a reading slump. Your comment will enter you to win a hardcover copy of Struck, signed by Jennifer Bosworth. Remember to leave your email with the comment so we can contact the winner. Contest open to US residents only. Deadline is Friday, August 9. Any time I'm feeling a bit off in my reading habits, I read one of Jim Butcher's THE DRESDEN FILES books. They always help get me excited about reading again. After reading a whole raft of teen angst in the YAs I recommend on BooksYALove, I grab a goofy/slapstick or historical fiction middle-grade book to get me back in balance. Some recent faves are Bo at Ballard Creek (historical, Alaska! by Kirkpatrick Hill) and A Tangle of Knots (whimsical, light magic, by Lisa Graff) - they remind me that the world is love and small delights, as well as the big problems faced by teens in YA. I always recommend John Green for getting out of a reading slump. Funny, engaging, easy to read, and touching. Everything a book should be! It's been a long time since I've read a book that was the complete package, and Struck has it all. 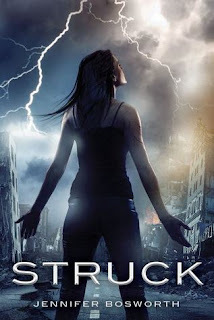 More intelligent and powerful than the average YA novel, Struck is an electrifying debut that hits all the right buttons.